Crytek has decided to brighten up everyone's return to work by issuing a new screenshot from Crysis 3. The new screenshot showcases Cell Corporation and Ceph forces, both of which will give Prophet headaches in the shooter. "8 CELL troopers on patrol. 3 hungry Ceph Stalkers. Who do you think the hunters are in this #Crysis3 screenshot?" said Crytek in the introductory tweet. 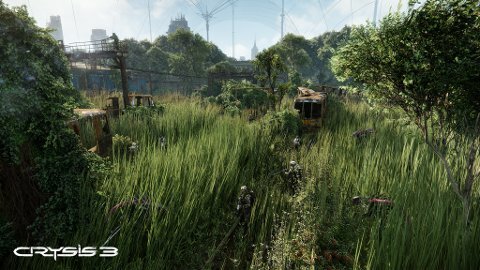 The location depicted is a train yard in Manhattan that has become overgrown with tall grass. This train yard was previously seen in a gameplay video from last month. In the video, Prophet and fellow supersoldier Psycho wade into the grasslands and fight Cell and Ceph alike. Crysis 3 will hit the PS3, Xbox 360 and PC in February.